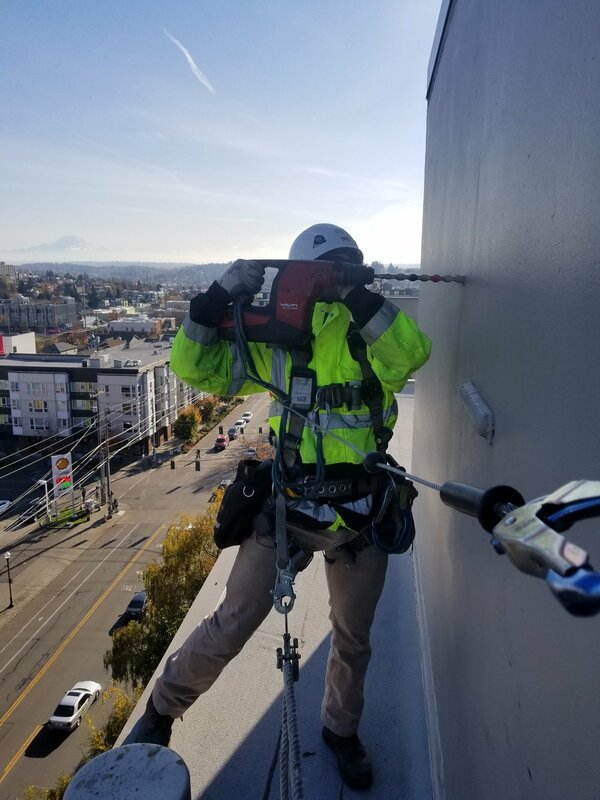 Since 1998, Excalibur & Associates-WA, Inc. has been providing safe working environments for clients throughout the U.S. We specialize in fall protection installation, including horizontal and vertical lifelines, anchorage connectors and Personal Fall Arrest Systems (PFAS). Excalibur installs lifelines and fall protection systems to meet your site-specific needs and we conduct annual inspections to satisfy OSHA and ANSI requirements. We provide temporary and permanent fall restraint or fall arrest systems to meet your site-specific safety needs. Get in touch with us to get a quote for installation, to schedule an annual inspection, or to re-certify a lifeline system. Use the contact form at the bottom of this page to inquire whether our services are right for you. As a distributor and approved installer for 3M Fall Protection, and as a certified installer for DBI/SALA, Excalibur is qualified to design, install and conduct annual lifeline inspections and re-certify lifelines for DBI/SALA and 3M Fall Protection. Excalibur will help you choose fall protection equipment that effectively protects workers from hazards while remaining in compliance with government regulations. See our service categories below to determine how we can help you today! Qualified to design and install 3M Fall Protection and DBI/SALA permanent horizontal lifeline systems to meet OSHA requirements. Excalibur offers 3M Fall Protection and DBI/SALA product lines that provide temporary fall protection when combined with the appropriate full-body harness and a shock-absorbing lanyard. Provide and install custom-designed and engineered (where required) fabricated anchorage connectors to meet site-specific fall protection requirements. Excalibur is qualified to conduct annual inspections and to re-certify lifeline systems for 3M Fall Protection and DBI/SALA. Lifeline systems installed by Excalibur can include a hands-on training session for system users. Our company will schedule a site visit, if appropriate, to conduct a specific fall protection installation analysis. Site visits are valuable tools to determine requirements for new systems and to review existing fall protection issues. Use the form below to contact us regarding your fall protection needs. Please be as detailed as possible. Include your industry along with any specific requests. You may also email or call us to make an appointment.